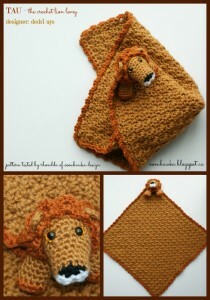 I would like to introduce you to Tau the Crochet Lion Lovie (Comfort Blanket). I asked the ladies on Facebook for some names and they came up with a few great ones. I liked the sound of Tau the most. NOT because my mom suggested it, but because it means Lion in Sesotho (one of South Africa’s 11 official languages). And now that you have had your fact of the day, let me tell you more about Tau. 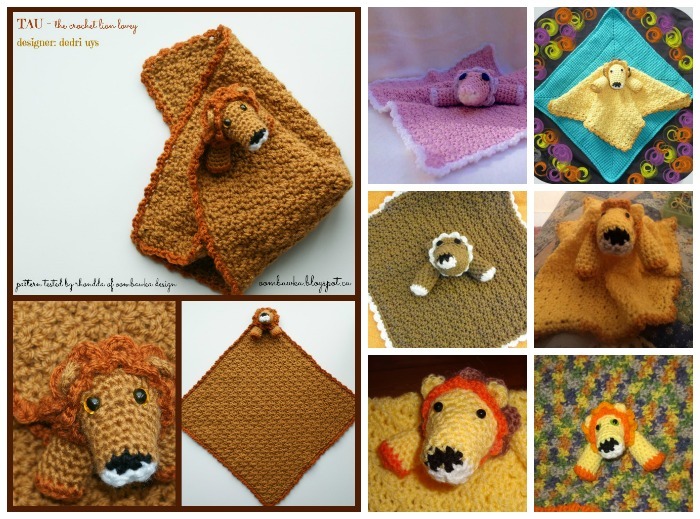 This crochet lion lovie would make an excellent gift for a newborn. The slightly textured blanket and the addition of the mane and scallops should keep both baby’s eyes and hands happy. And don’t, for a second, suppose that all lions should be yellow. I am hoping to make one in grey soon, with a nice turquoise mane! 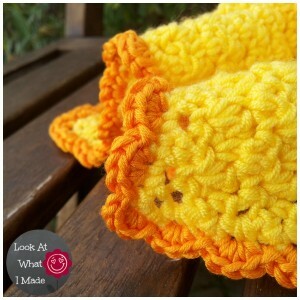 If you feel like making a set, why not use the blanket pattern on its own to create a matching washcloth? This crochet pattern is suitable for Advanced Beginners and includes plenty of photos, as well as links to help you with things like running stitch markers and short rows. It is written using US Crochet Terminology, but I have also included a link to a comparison chart, both for hook sizes and stitch names. I made my little Lion Lovie in yellow and orange. I included feet (which are optional) and stuck the head bang in the middle of the blanket. My friend Rhondda, from Oombawka Design, made her Lovie in browns. She also attached the head to one of the corners, which I much prefer. When I saw her blanket, I had one of those why-didn’t-I-think-of-that? moments. 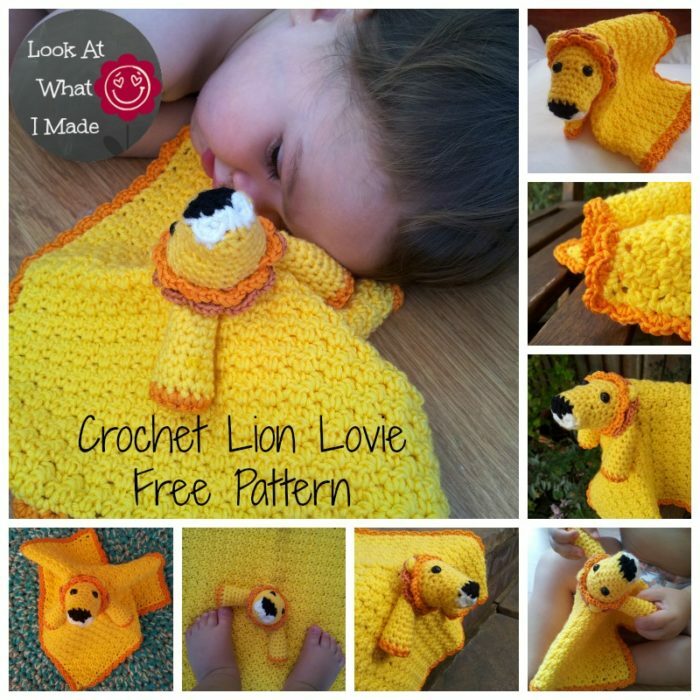 Whichever way you decide to make your Lion Lovie, I hope you have great fun doing it! You can find the free PDF Pattern here in my Ravelry Store. Using the hook and yarn specified, your comfort blanket will be anywhere from 27 cm (10.5”) to 35 cm (13.5”) square. The head for the lion is worked in the round (in a spiral), as are the legs – which are completely optional, by the way. The most fiddly part of the whole thing is the nose and mouth, but if you follow the photos and instructions carefully, you’ll be just fine. I am happy for you to make as many of these Lion Loveys as you want – both for personal use and for small-scale sale. Please just keep in mind that this pattern has taken me A LOT of hours to write and refine, so I ask that you credit me as and when you make anything using this pattern (even if you modify it). If you would like to “share” the pattern with your friends, please share the link to THIS page, so that they can have the opportunity to look around. Please do not copy or reproduce the actual pattern in any way, shape or form. You can see some more of their lovely lovies here. I hope you have lots of fun creating your Lion Lovie. You can share your projects by either adding them as Ravelry projects or by posting them on my Facebook Page. Is there a way to make this a little bit bigger, like a small afghan? You can make it as big as you want. Start with an uneven number of chains that is as wide as you want your blanket to be, then make as many rows as you need to get to the desired length. You might have to fudge the border a bit, but that shouldn’t be too tricky. Your little lion is adorable! Can’t wait to start him–I’ve also been looking for a monkey lovie pattern, have you ever made one before? Thank you! Hi Kathleen. Unfortunately I don’t have a video tutorial. I know I must have done something wrong, but I can’t figure it out. I have ripped out this poor lion’s snout five times, and I can’t get his face centered over the nose. I start the yellow in the correct stitch after attaching the black and white together. I reach the proper number of stitches when I am supposed to. And yet when I get to rows 7-9 on his face, it winds up to the far left of his nose, not centered over it. I have counted and recounted. Is there a mistake somewhere in the pattern? This is the first time I have done a stuffed animal in crochet. Hi Jen. I would love to help you! It is much easier to understand what is happening if you can send me a photo of your lion face up to the end of round 9. Do you use a running stitch marker? I strongly suggest that you do so if you haven’t. When you mark the first st of each round with a running st marker, the last st of the round should fall in the stitch BEFORE the st marker. This would be the first thing I check. I’ve double-checked and the pattern is correct. Thank you so much! I spent hours looking fora free lovey pattern you are a godsend! Hi Carrie. If you click on the arrow it will save the PDF to your computer. Do you have a link to the pattern somewhere? I noticed that you have something that looks like the pattern under the “add this pattern to your ravelry queue” but it doesn’t look like what you normally do. I wanted to print the pattern out so if that IS the real pattern I’m sure I’ll find a way to print it out eventually. It’s probably just me and my bad searching skills :) again anyway so I’m probably wasting my time writing this instead of just looking for the link :).